The escape response to evade perceived threats is a fundamental behavior seen throughout the animal kingdom, and laboratory studies have identified specialized neural circuits that control this behavior. Understanding how these neural circuits operate in complex natural settings, however, has been a challenge. A new study led by researchers at UC Santa Cruz and NOAA Fisheries overcame this challenge using a clever experimental design to record and analyze escape responses in coral reef fish. The results, published November 12 in Proceedings of the National Academy of Sciences, reveal how a sequence of well-defined decision rules generates evasion behavior in a wide range of coral reef fish species. "We took an approach used in laboratory studies into a complex, natural environment and found that the same behavioral mechanisms seem to apply. A set of simple rules are combined in different ways to generate a rich suite of behaviors to accomplish this fundamental goal: to avoid being killed," said first author Andrew Hein, an assistant researcher at the UC Santa Cruz Institute of Marine Sciences and research ecologist at the NOAA Fisheries Lab in Santa Cruz. 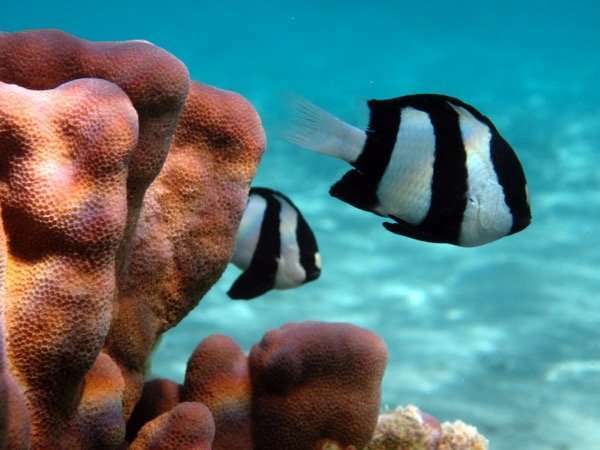 The coral reef fish in the study feed on algae in shallow reef flats, where they are vulnerable to predators such as moray eels and reef sharks. To simulate a threat, the researchers employed a widely used visual stimulus called the looming stimulus, a black dot that grows in size slowly and then rapidly, creating the illusion of a rapidly approaching object. A waterproof tablet computer deployed on a coral reef in Mo'orea, French Polynesia, played the looming stimulus, while video cameras recorded the responses of fish that swam into the area in front of the tablet. The researchers then used computer vision technology to analyze the video. Automated tracking and a method known as "ray casting," originally developed by video game designers, allowed them to reconstruct what each fish was seeing as it decided whether or not to flee from the threat. They found that fish initiated escape maneuvers in response to the perceived size and expansion rate of the threat stimulus using a decision rule that matched the dynamics of known loom-sensitive neural circuits. "This same behavioral circuit that neuroscientists identified in lab studies seems to be operating in the more complex natural environment," Hein said. "But we also found something new: the sensitivity to the looming stimulus gets tuned up or down depending on the locations of other fish. If an individual is the closest one to the stimulus, it is much more likely to flee than if there is another fish between it and the threat." A third factor in the escape response was the location of a safe place to shelter, offered by a mounding coral alongside the experimental area. The initial response to the stimulus is to quickly turn away from the threat, but almost immediately the fish then began turning toward the shelter and swam directly toward it. "When you look at the paths they take, it looks like spaghetti—they're all different—but the analysis shows they're all generated by the same simple set of behavioral rules," Hein said.